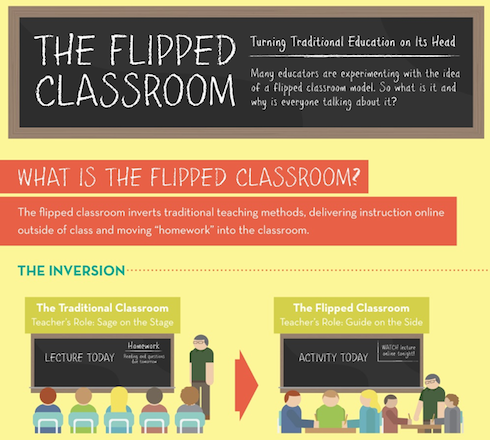 What is "Flipping the Classroom?" “Flipping” is a concept derived from Dr. Lodge McCammon, Specialist in Curriculum and Contemporary Media at the Friday Institute for Educational Innovation at NCSU. Flipping is a system where the teacher pre-records their lessons and posts them to their website. Students are to watch the taped lessons at home before class. This allows students to come to class prepared with some background knowledge of content, and questions for discussions. Students will complete a flipping homework guide which will allow them to take notes on key concepts and vocabulary, pratice problems, make connections to real world application, and add questions or comments about the skill being taught. Teachers will plan for differentiated activities for remediation, review, or enrichment of students depending on how well they grasped the concept. Flipping will also serve as a resource for parents, allowing them to have full knowledge of classroom instruction and assist with their child’s learning. This model is developed for secondary education, but last year was piloted for implementation in the elementary level with great success! I saw wonderful results from all of my students, as they were engaged in higher level thinking, and participating in collaborate groups doing differentiated activities at their instructional level. Students will also be creating their own flip videos and paper slides during class to demonmstrate knowledge and application of skills. iPads to view the lessons in the morning. Videos may also be viewed on smart phones. In the upcoming weeks you will be receiving further detail and instruction on how to assist your child at home with “Flipping”. Please feel free to visit www.fi.ncsu.edu/fizz for more information. See the videos below to review 4th grade skills! In addition to watching Ms. Munafo's videos, please check out this link to search for additional videos on nearly every topic!